One day I went to my grand-parents house and my cousins were there. We played, had lunch, and then I started watching the story of the 2 towers on T.V. Then, 1 of my cousins rushed into the room yelling " Look, we found a leaf bug!!!!!" I looked, and, sure enough, there was a leaf bug. I told my cousins to wait while I went to look at the recycle bin for a tupperware. I found 1 and put the leaf bug inside. And we decided to give it to someone we knew. Okey dokey, what is a leaf bug? 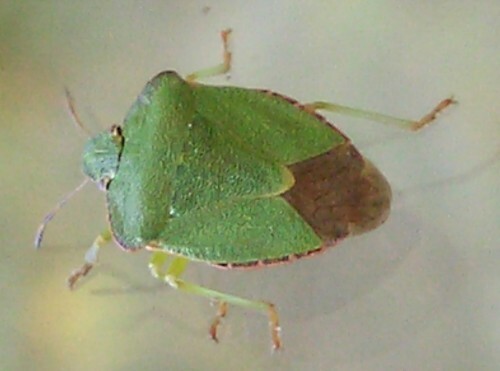 It's actually called a shield bug and looks like a leaf.